ABC have replied to our complaint (Half truths in hot weather story) that covered factual inadequacies in a report by ABC environment report Sarah Clarke. The report 2010 on track to be hottest year was based on half truths promulgated by BOM's Dr David Jones. Truth: Parts of the Middle East and Pakistan record temperatures into the low 50’s pretty much every year. Half truth: Beijing the other day just fell short of 41. Truth: The recorded temperature was 40.3 (104.5F).http://www.chinadaily.com.cn/photo/2010-07/05/content_10067517.htm. Note that this "record" is based on Beijing’s official temperature records commencing in 1951. See reports of earlier heat waves in the original post that indicate higher temperatures have been recorded in Beijing, including one at 46.1C..
Half truth: We're seeing 40s right up and down the US eastern seaboard. Truth: Perhaps 40 at just one location! Truth: And what about the 30-50 years prior? ABC respond (received 1/9/2010): "With regard to your concerns about the accuracy of statements made by Dr David Jones, a senior climatologist at the weather bureau's National Climate Centre, the ABC does not consider opinions or the views of a specialist commentator to constitute factual content; therefore, it is not subject to the accuracy provisions outlined in the ABC’s Editorial Policies. However, while there is no obligation to fact check opinion, it is expected that the specialist commentator or expert is properly qualified to speak to the subject at hand, and that their views are clearly attributed. On review, Audience and Consumer Affairs is satisfied that Dr Jones is appropriately credentialed to comment on temperature trends, and that the views he expressed were properly attributed. While noting the points you make, we are satisfied that there was sufficient context in the story, and that it is in keeping with the ABC’s standards for accuracy." 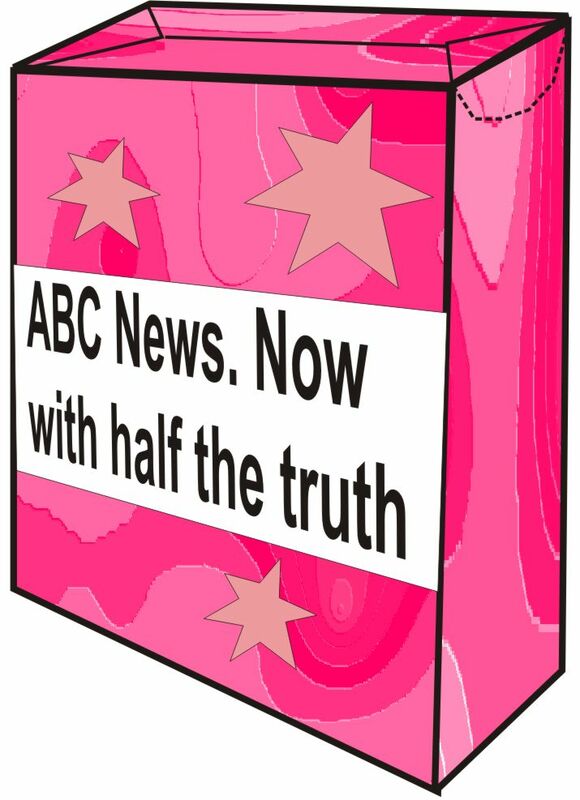 The lesson: Don't rely on ABC's biased experts to provide the full story. In relation to Sarah Clarke's reporting Andrew Bolt has this piece that might interest: Modern Journalism. Wish I had a buck for every reply, similar to the one above, I've had from that corrupt, biased pack of taxpayer funded hypocrites! They'll never admit they're wrong, and they'll take 30 days to answer! Laughable! Marc's half truth: The recorded temperature was 40.3. 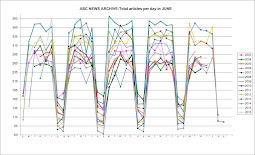 Truth: The recorded temperature was 40.6 (http://www.google.com/hostednews/afp/article/ALeqM5j0hPIJuKOHBxMqHwxYl0f-fM43xA; http://au.news.yahoo.com/a/-/world/7539239/china-on-heatwave-alert-as-temperatures-soar/). Seems pretty reasonably to describe that as just falling short of 41. Marc's half truth: "And what about the 30-50 years prior?" Truth: Jones was talking about the last 30 to 50 years (i.e. from 1960 or 1980 to the present), not the 30 to 50 years before that. Even if the previous 30 to 50 years had shown an increase in heat waves, or more heat waves than the 1960/80 to present period, that wouldn't invalidate his claim that the Bureau of Meteorology has seen an increase in heat waves in Australia in the last 30 to 50 years. Anyway, Marc, are you seriously suggesting the ABC should pour its resources into fact-checking what expert interviewees like Jones say? Surely that would result in a huge reduction in the 'productivity' your surveys so wonderfully highlight. How far would you want it to go? What about, say, when Kerry O'Brien interviews a politician – should they pre-record the interview, fact-check all of the politician's claims, and then edit out the exaggerations and false claims? That's the logical extension of your criticism of this article. Fact checking, and scepticism of sources are among of the basics of journalism. Sad that some ABC reporters seem to have forgotten the simple things. The logical extension of the article would be the production of higher quality news reports. Yes, but surely you understand the difference between asserting a fact and quoting an expert? The only assertion being made when the article says (to take one example) “"We have seen an increase in heatwaves in Australia in the last 30 to 50 years," he said” is that Jones actually said that. Do you think readers would expect that the ABC has checked it? If they'd checked the fact, what would be the point of presenting it as an attributed claim? They could just state it as fact and not bother to quote Jones at all. If news organisations were required to verify every claim made by an expert or other interviewee, there'd be no interviews. Let's apply your reasoning to another article, selected at random from today: "Girls fall four metres from window" http://www.abc.net.au/news/stories/2010/09/01/2999626.htm. The article quotes Bankstown Acting Inspector Brooke Smith as saying "The [child] below has actually broken the fall of the other child. Four metres to the ground. It might not seem far, but you can see from the injuries sustained, that it's an inadvertent accident that's occurred with serious injuries". Now, by your reasoning, the ABC should have checked this – perhaps by examining the childrens' x-rays? Or should they have perhaps held off on the article until the children are well enough to verify the claims of the police? Alternatively, maybe it's reasonable to present the quotes for what they are – claims made by a relevant expert: in this case the police, in the 2010 hottest year article a senior BoM climatologist. Surely readers are savvy enough to apply their own scepticism on the basis of the credentials of the person the quotes are attributed to.